Meeting point in Uzès, Cordeliers car park, one hour before sunrise (5: 15 in summer). We will drive you, to take-off place, adapted to the day’s winds. After the captain’s instructions, you will take part, if you wish to do so, in preparing the hot air balloon. 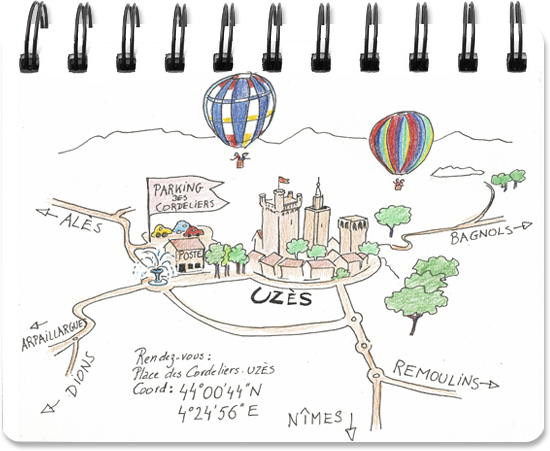 Gentle take off…then, going with the wind, fly over the Garrigue, villages around Uzès or the Cèze valley. A magical moment out of time ! The pilot lands the hot air balloon in the countryside. A vehicle will be there waiting. After storing the equipment in the trailer, the new aeronauts receive the « Celestial Ascension Certificate ». Flying in a hot air balloon is possible for all people aged 6 and over, no age restriction. Only pregnant women are not allowed on board. Children must be accompanied by an adult and will be under his responsibility. A minimum height of 1,30m is required for vision comfort. Passengers must be able to climb in and out as well as stand during the flight. If you have any doubts, please ask your doctor and keep us informed when booking and tell the pilot before take off. protect you from the heat of the burners. Any equipment you take on board is under your own responsibility.